This is the pocket for the apron of the doll I've been working on. Debbie Magee Design - Washday Winnie. It was in Homespun last year. I made her then in green with red trim. This time I'm using purples with a green mint trim. You're supposed to use an old doiley for the pocket - I don't have many of those, so made this one myself!! The first block I've done for Gardener's Journal. 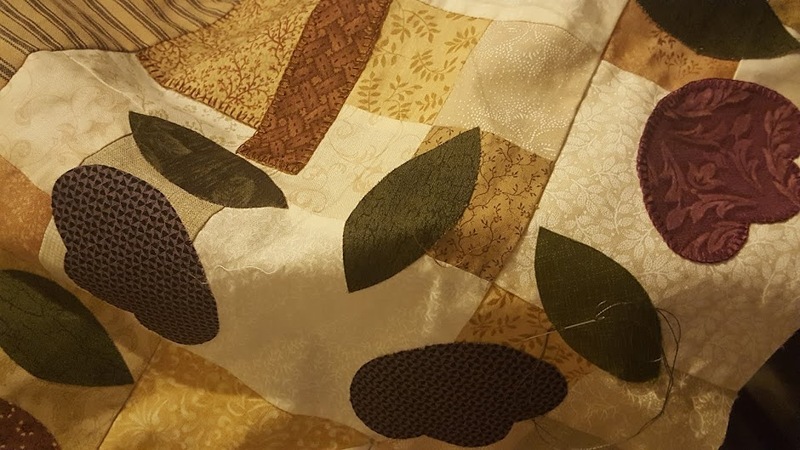 I know the stitchalong is over, but I've seen so many nice quilts on the blog that I've succumbed to the temptation. The first block in the Home Sweet Home BOM. I've stitched this one, but have also put together some in an applique version. Didn't get to stitch those last night. These are my completed blocks for 'Tis the Season. I have to add two more borders. I ran out of time to do this last night. I'm now going to be working on the smaller projects included in the book. This is the doll I'm working on. I didn't do this at FNSI, but the pocket is for her, so thought I'd include a picture. I have some more work to do - like her face and she has laces on her boots. She'll be a hanging dolly as well. And there is a button to go on her collar, but I like the way she is coming along. It's been lots of fun. So that's it for me. I'm off on holidays today with the whole family. We have land near Bundaberg and will be staying there. I've packed lots of hand stitching. I'm hoping to mainly work on my hexagon quilts. My daughter and I are making a yo-yo quilt as well. We have lots of pieces cut out for that. It's been an eventful first few months to 2011, so hoping for a quiet and relaxing holiday. Will follow blogs on my phone. Your homemade doily looks great (and isn't that what doilies are supposed to be - homemade?). It will be a lovely pocket on the doll's dress fabric. And those gardening ladies? Fabulous! Really lovely work. Thanks for sharing. Couldn't find a Christmas item but your FNSI work is lovely. I like the Gardener's Journal ladies and your doll is gorgeous.